We dug a little trench, placed our seed potatoes at appropriate intervals, and covered them with soil. We planted these guys four inches deep, per the instructions from Seeds of Change. So far, so good, right? Well, I guess it’s good until you have to mound them. Mounding potatoes that have sprouted at ground level is a royal pain the petutie. The whole time, you’re fighting gravity and erosion, not to mention the voluminous potato plant that has lots of airspace between its lower branches — which further fends off the mounding effort. The first 6-12 inches of mounding was pretty easy. But after that, we found ourselves cutting a deep trench–great for tripping over, by the way–into the path just to try and get enough soil to dump on top of the potato row. We used wheelbarrows. We used shovels. We used hoes. We struggled mightily. Next time, we are planting the potatoes in a deep trench, which we can then simply cover over–by eroding in the sides of the trench, instead of fighting erosion–as the bushes grow up. (We’ll make sure the trench is fairly wide, or at least in a well-dug bed, because potatoes have a hard time busting through compacted soil, and the potatoes tend to sprout out to the sides). You know, I’d visited a big-scale potato farm that seemed to have their potatoes mounded up well above the surface–a good two feet, neatly done–but come to think of it, they had big gigantic machines that did that. The human labor for above-ground mounding potatoes, at least in our situation, was way too much work. 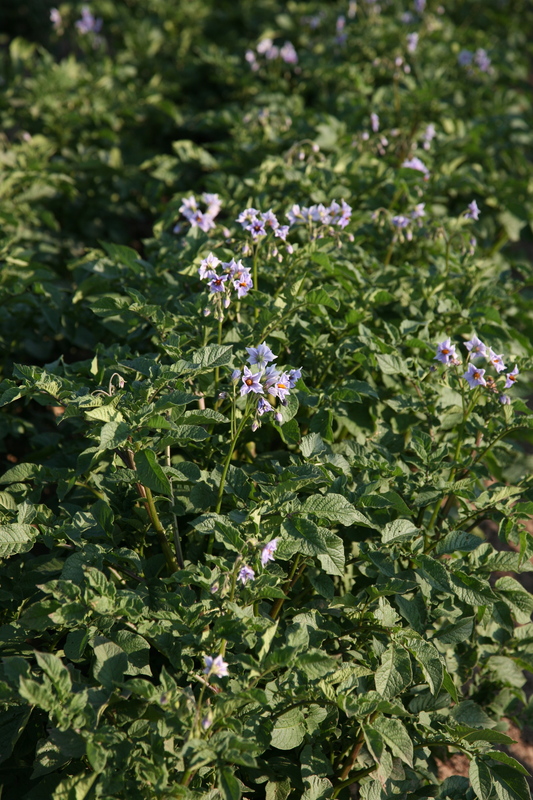 This is another of those greenhorn moments: while we’ve tended potato beds before, we’d never had to go through the whole process ourselves, from the planting to the mounding to the harvesting. From the start, it’s been an eye opening process, and I’m getting a little nervous for the finish: I can’t wait for the harvest, but I’d better not get my hopes up. Our watering has been a system of guesswork. Our soil is a tad on the clay side, although we did add manure. And while the bushes look beautiful, it’s a little scary having no idea what the crop is doing underneath the soil! Here’s hoping.